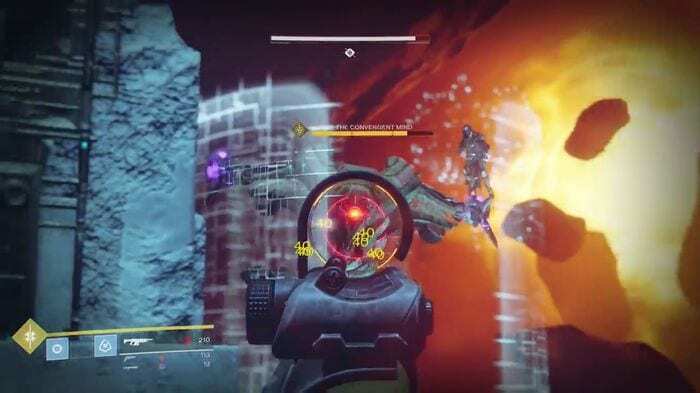 This page contains information about how to defeat Hapax, the Convergent Mind in Destiny 2. Hapax appears as the Boss of Mission 8 – Looped Walkthrough. He will be surrounded by a mob of Goblins to do his bidding, which raises the number of threats. Another concern is that the Goblins will continue to storm the area, thus this boss fight essentially requires some fancy footwork. In order to rescue Cayde-6, initiate the fight by following the open path. Unload the first shot at the approaching Hapax, indicated by the exposed ocular. Be sure to take cover behind the walls as you reload whenever the enemy’s forcefield rotates. It will eventually follow your location so be sure to keep distance and return fire on its opening while you back up. Make haste to the platform above to get some breathing room. Take out the surrounding enemies patrolling the site as you await for Hapax to chase you. Minotaurs and Goblins are scattered from left to right to which you can freely snipe. Defeat them quickly to leave Hapax the last one standing in order to plan your movements without additional nuisance. Dodge Hapax’s shots while you finish off the remaining enemies by finding some cover. Search for the Boss’ weak spot as you peek from the corner of a wall, then pull the trigger to unload a barrage of bullets. By the time its health is reduced to 1/3, Hapax will warp to the opposite side. Before you pull the trigger, deal with the Minotaur and Goblin reinforcements first to prevent them from pestering the Boss fight. Keep dashing if you get in the enemies’ line of fire, and repel them with another barrage of bullets. Continue to scale to higher ground as you wait for Hapax to continue its pursuit. Snipe it from the corner of the wall making sure to always line up the shots on its exposed side. Once it gets floored for good, avoid collecting the head as bounty as it will detonate.